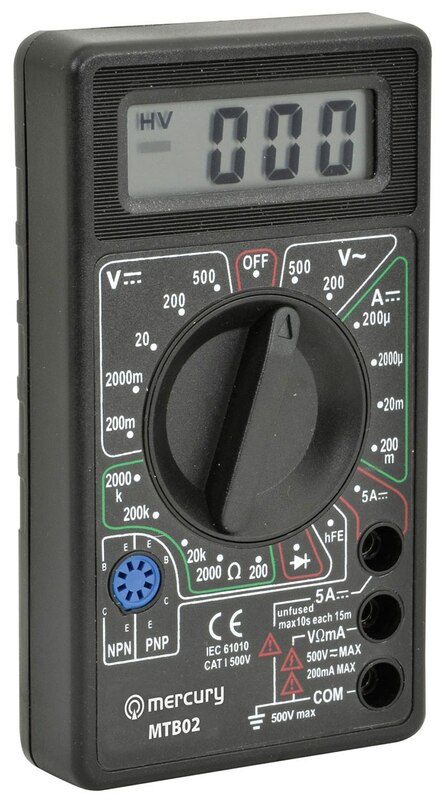 A Pocket size digital meter. 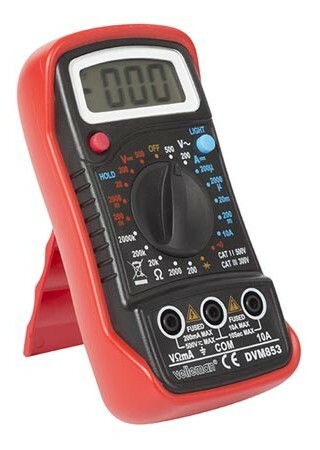 Ideal for basic to intermediate testing requirements by Electronic Hobbyists, Education Establishments and Motorists. 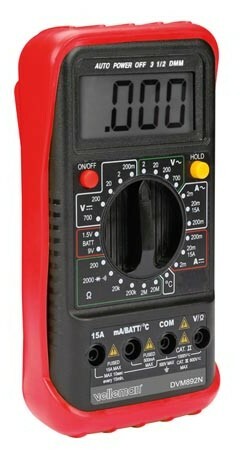 Supplied with test leads and manual. Pocket size digital meter. Ideal for Education, Hobbyists and Motorists. Continuity Buzzer, Capacitance, Diode and HFE Test. Supplied with shrouded test leads and shock proof rubber holster. A small digital meter that will fit neatly into anyone's pocket. Professional 3.5 Digit tester with 8 functions and 24 ranges. 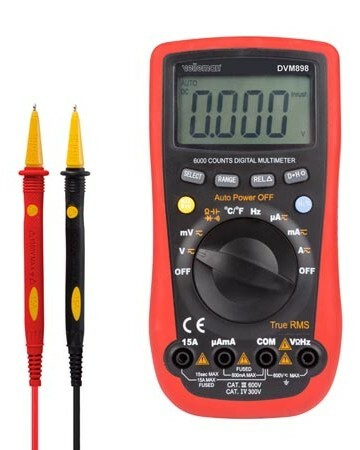 Measures AC and DC voltage, DC current, resistance, diode and transistor test, auto zeroing and overload protection. Professional Digital Multi-tester. 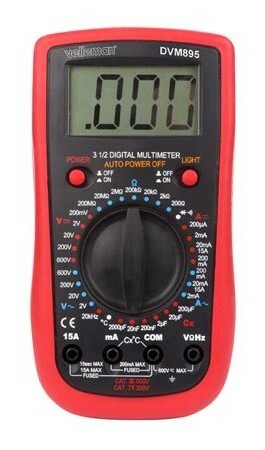 With LCD display, AC voltage (@1.0mV Resolution), DC voltage (@0.1mV resolution) and resistance measurement. Auto power off, continuity checking with buzzer, diode check, Supplied with test leads. Professional Digital Multi-tester. 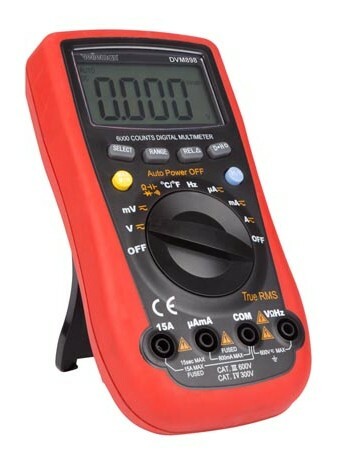 With LCD display, AC voltage (@1.0mV Resolution), DC voltage (@0.1mV resolution), AC current (@1.0mA Resolution), DC Current (@1.0mA Resolution) and resistance measurement. Auto power off, continuity checking with buzzer, diode check, Supplied with test leads. Industrial Digital Multi-meter. 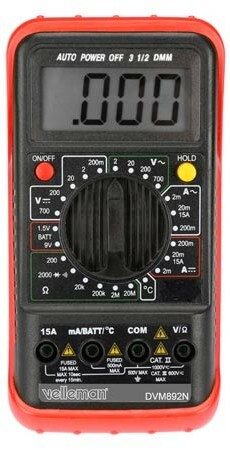 With LCD display and Bargraph, AC voltage/current, DC voltage/current and resistance measurement. Auto power off, continuity checking with buzzer, diode check, Supplied with test leads. A Digital meter that will fit neatly into anyone's tool bag. With large LCD display, auto power off, continuity checking with buzzer, diode check, temperature, voltage, resistance and current measurement. Housed in an impact resistant rubber holster with integral stand. resistance measurements: 200 MOhm max. capacitance measurements: 200 µF max. Professional Digital Multi-tester. 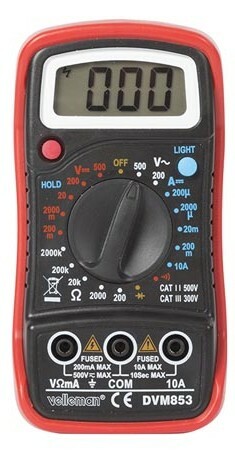 With large LCD display, auto power off, continuity checking with buzzer, diode check, temperature, voltage, resistance and current measurement. Housed in an impact resistant rubber holster with integral stand. Professional Digital Multi-tester. 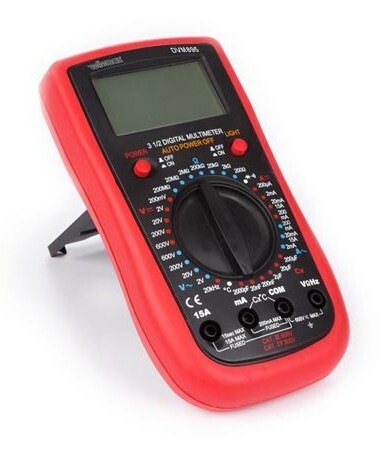 With large LCD display, auto power off, continuity checking with buzzer, diode check, temperature, frequency, voltage, resistance and current measurement. Supplied with type K thermocouple and socket and PC-link software CD. Housed in an impact resistant rubber holster with integral stand.